This cold sesame cucumber noodle salad was something I ate all summer long. 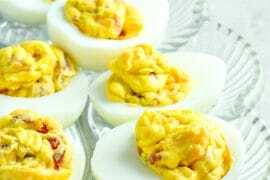 It’s quick to prepare and makes for a light, refreshing side or main dish. Now that the sun has disappeared and the weather has gone south, you’d think I would be over this easy cucumber salad by now. And you’d be wrong. I’m all for seasonal eating, but as long as cucumbers can be found year-round at the market, they have a space in my shopping cart. Rain or shine, sesame cucumber noodle salad is guaranteed to be on my meal plan! What Seasonings are in Sesame Cucumber Salad? 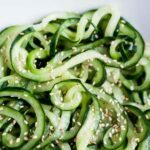 Rice vinegar and sesame oil are whisked together in a 1-to-1 ratio to create the sesame cucumber noodle salad dressing. 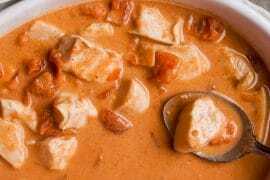 You can add a splash of coconut aminos (liquid aminos or soy sauce would work too) for a savory, umami flavor or toss in red chili flakes for a little heat and pop of color. 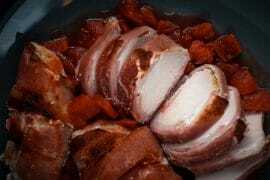 The rice vinegar-sesame oil base is incredibly versatile, so you can adapt this recipe to please your palate. Last but not least, sesame seeds are used to garnish the salad. Most sesame cucumber salad recipes have sugar in them. Why do they always have to ruin a good thing? Since we’re all cutting carbs, we won’t be using any sugar. 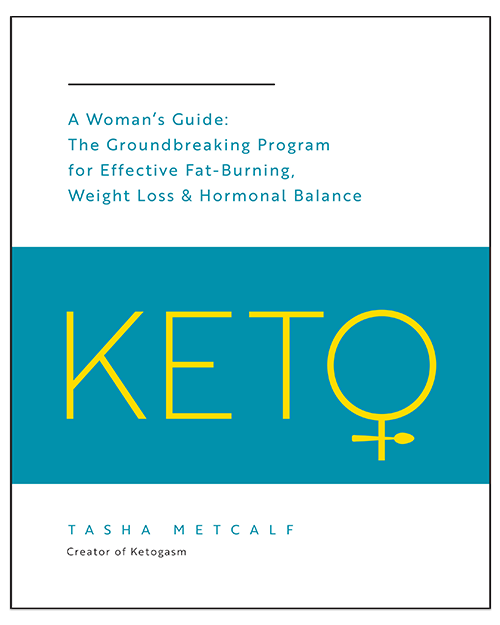 If you really need the sweet to balance the tart, try using Erythritol instead. How do I Make Cucumber Noodles? 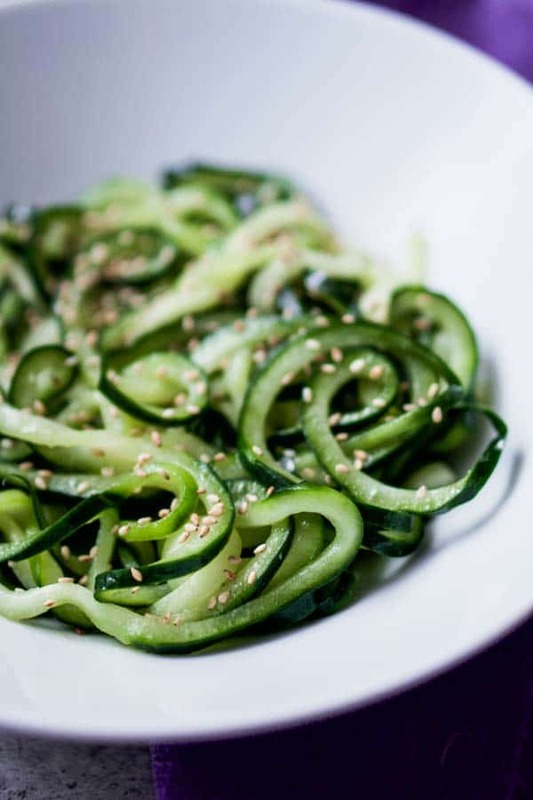 To make cucumber noodles, you will need a spiralizer. These come in a variety of shapes, sizes, and price points, but I prefer to use a countertop stand with a hand crank. I’ve tried several spiralizers and my favorite by far is The Inspiralizer. Chop off each end of the cucumber to create a flat surface. Select your preferred blade size on the spiralizer and secure your vegetable between the blade and handle. Turn the handle and gently press your cucumber into the blade with the guide or your free hand. Continue until the entire vegetable has been cut into long strands of cucumber noodles. Cucumbers are full of moisture that pools once cut. To prevent the salad from becoming wet and soggy as it sits, we need to salt the cucumber noodles and let them rest for 15 minutes on paper towels. Pat the cucumbers dry before dressing them in the prepared sesame oil vinaigrette. 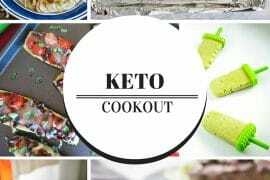 Both cucumber noodles and zucchini noodles are delicious and make an excellent pasta substitute for a low carb, keto, or gluten-free dieter. Cucumbers are favored for raw or pickled recipes but can be enjoyed in a variety of salads, soups, and even sauteed. Cooling to the palate, the phrase “cool as a cucumber” refers to the cooling effect of the vegetable, not Fonzie cool. This makes them an excellent pair for something spicy. 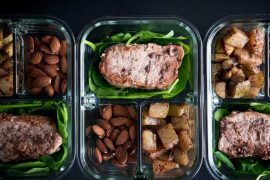 The taste is light and sweet, which makes them a pretty neutral low carb vegetable to be enjoyed with just about anything. Not surprisingly, zucchinis have many of the same qualities. The main difference between cucumber and zucchini is that zucchini is not nearly as delicate. 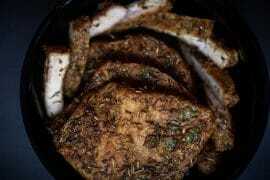 It can hold up to more robust cooking techniques than the cucumber: frying, grilling, roasting, and baking.You can eat zucchini raw, although it’s not the most popular cooking method for it. The flavor of zucchini is a tad stronger, so it doesn’t disappear into the background the same way cucumber does. Think about what type of dish you want to cook when deciding between cucumber and zucchini to guide your choice! 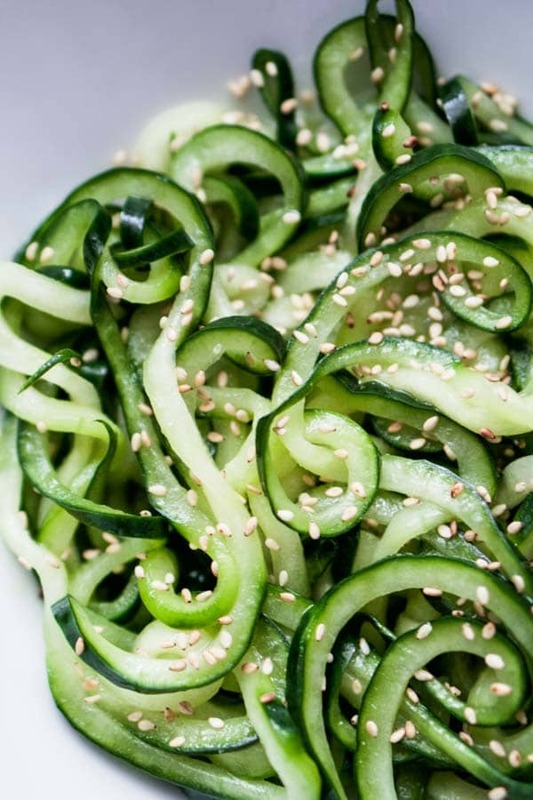 Cucumber noodles make for a light, refreshing sesame salad! 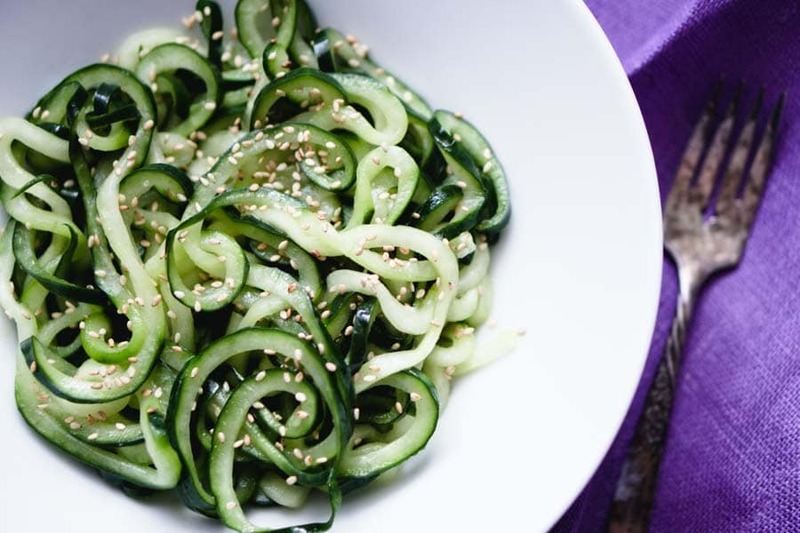 Use a spiralizer to cut cucumbers into thin noodle-like strands. Lay out on paper towels and sprinkle salt over the cucumber. Let sit for 15 minutes and pat dry. Taste a piece of the cucumber. If it is too salty for your taste, rinse the cucumber noodles off. Pat dry with paper towels. In a mixing bowl, whisk together sesame oil and vinegar. 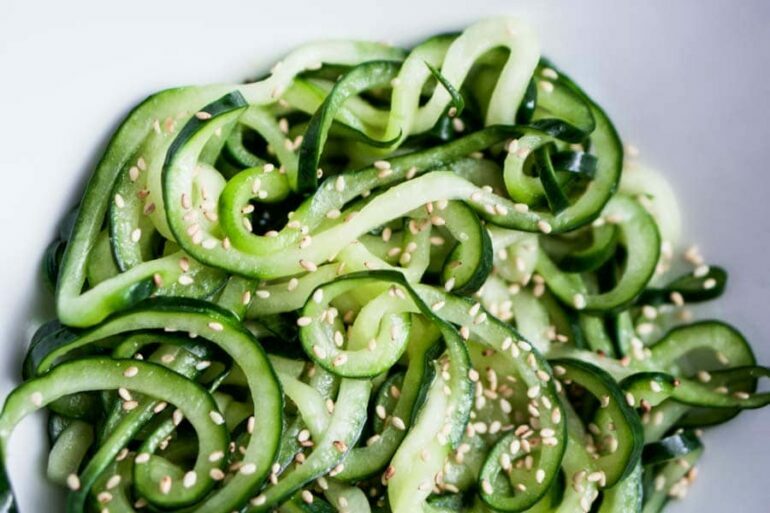 Dress the cucumber noodles with the prepared vinaigrette and garnish with sesame seeds. Salt to taste.